Sasha Velour is a winner. In June of 2017, the drag queen took home the crown on season nine of RuPaul's Drag Race. More than a year later, she's still using her queendom to spread the word about drag, and challenge perceptions about the art form. On stage at the Bell House in Brooklyn, New York, Velour was dressed in yards of shiny silver fabric adorned with hundreds of huge, multicolored gems. 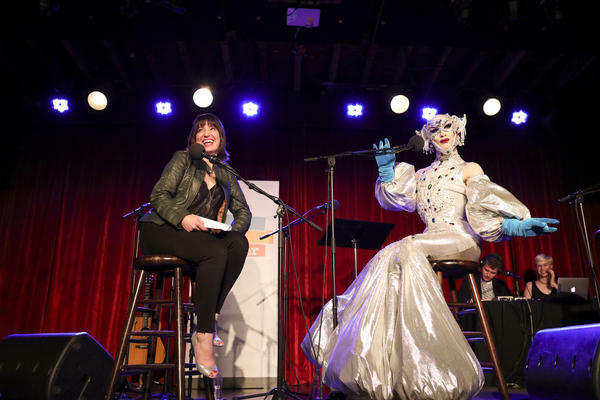 She described the look to NPR's Ask Me Another host Ophira Eisenberg as "a crown as a dress," or "what Queen Nosferatu wears to her daughter's lesbian summer wedding." "Sasha Velour" is the gender-fluid drag identity adopted by Alexander Hedges Steinberg. Velour explained the essence of drag: taking clothes and the beliefs surrounding them and making them one's own. "People are so serious about ourselves, and drag suggests that maybe it's all just a bunch of ideas and we can be a little bit more flexible with them," she said. Unlike many drag queens, Velour often forgoes wigs and appears on-stage with a bald head. It's a tribute to her mother, who had cancer for the last five years of her life, and became bald as a result of chemotherapy treatments. "It was something we talked about a lot," Velour said, "because she was worried about how she'd be received out in the world as a bald woman, when femininity and hair are so significantly tied, culturally." Eventually, after seeing her mother "rock her beautiful bald head every single day," she said, "I thought, 'That to me is just the essence of beauty and power, and I want to rock that in my own life.'" Velour's baldness was highlighted in the performance that led to her coronation as the winner of RuPaul's Drag Race season 9. Lip syncing to the song "So Emotional" by Whitney Houston, Velour took the stage wearing a red wig. At the climax of the song, she removed it. "I had the entirety of Michael's craft store rose petal department stuffed under my hair," Velour joked. The petals cascaded down her body, and onto the stage, bringing the live audience to its feet. "When you are feeling emotions about love or heartbreak or anything like that, it escalates and so I had to have the rose petals escalate as well and they sure did... There was a lot of truth and a lot of my biography in that performance." For Velour, drag is something that grants confidence in a world where "there are so many voices that tell people, especially queer people, that they don't have importance and regality," she explained. "Drag is about asserting your power and your brilliance and your importance... when a room like this is supporting you to the extent with love and encouragement like you get at a drag show, you really feel invincible and every person deserves to feel that." For her Ask Me Another challenge, Velour played a game of "This, That or The Other" against rapper and actor Awkwafina: Drag name, rap name or off-brand soda? "Absolutely anyone can and must do drag." "I thought I already had a pass on that rule because I had a full head of foundation under that wig." While Hannah and Maggie get ready for the final round, let's welcome our next special guest. She's the winner of "RuPaul's Drag Race" season nine. Say hello to Sasha Velour. EISENBERG: ...So I feel like it's necessary for us to describe what you are wearing. EISENBERG: So it is a bejeweled, very shiny, silver mermaid. VELOUR: Yeah. The idea is sort of a crown but as a dress (laughter). EISENBERG: A crown as a dress. EISENBERG: Yeah. It's got big gems on it and lots of pearls. It looks very majestic. VELOUR: I was saying it's - yeah. It's what Queen Nosferatu wears to her daughter's lesbian summer wedding. EISENBERG: ...What are they missing that they should know? VELOUR: Oh, my goodness. Well, so when you go to a drag show, you can see anything imaginable. Drag is just the idea that the clothes that we're told we have to wear are just the beginning of it. And you go from there, from putting on something that you think may be forbidden or someone once told you is forbidden. And you take that, and you let that transform yourself into a whole possibility of a person, a possibility of a job, of an identity, of a gender, of a name. And you take that on and wear it. You know, people are so serious about ourselves (laughter). EISENBERG: Yes, we are. Yeah. VELOUR: And drag suggests that maybe it's all just a bunch of ideas, and we can be a little bit more flexible with them. EISENBERG: So first of all, anyone can do drag. VELOUR: Absolutely anyone can and must do drag. VELOUR: I do, every day. EISENBERG: ...Bald. Shave it every day? EISENBERG: Every day. But you sport that for a very specific reason. Can you tell us about that? VELOUR: My mother had cancer for the last five years of her life, and she was completely bald. It was something we talked about a lot because she was worried about how she'd be received out in the world as a bald woman when femininity and hair are so significantly tied culturally. And she decided to just not worry about other people's comfort or other people's expectations and rock her beautiful, bald head every single day out on the streets. And I thought that, to me, is just the essence of beauty and power. And I want to rock that in my own life. VELOUR: I have no rose petals under these gloves. VELOUR: Sorry. I left them at home. VELOUR: That's because I can't dance at all. EISENBERG: ...You basically show your shaved head. EISENBERG: Now, prior to that on "RuPaul's Drag Race," I believe the rule - light rule was that you could only remove a wig if there is another wig underneath. EISENBERG: So would you - this was a subversive act on your part? VELOUR: ...Which seems like a lot more work to apply than a little, you know, kitty wig. VELOUR: ...Over all those rose petals. And thankfully, it stayed on until just the perfect moment to come out. And I wanted to capture the increasing tension of that song - when you are feeling emotions about love or heartbreak or anything like that, it escalates. And so I had to have the rose petals escalate as well, and they sure did. EISENBERG: Now, again, maybe this is just my interpretation, but I also felt it was a moment of, this is my authentic self that is coming through the sort of performance of drag. It was like a little extra window. Was that - is that me interpreting or was that - was it intentional? VELOUR: Not at all. From the very beginning, drag's been an outlet that I come to with hurt and pain and insecurity from my life. And I transform those feelings into something really over the top that gives me strength. And that number in particular - I thought about times that I have felt pain like that. And I wanted to transform it into something really real, so there was a lot of truth and a lot of my biography in that performance. EISENBERG: Interesting. And as a form of expression, as you've explored it over the years, what would you say it gives to you? VELOUR: It gives you confidence and power. You know, there are so many voices that tell people, especially queer people, that they don't have importance and regality in the world. And drag is about asserting your power and your brilliance and your importance, sometimes way too ridiculously. VELOUR: ...You really do feel invincible, and every person deserves to feel that. EISENBERG: All right, Sasha. Are you ready for an ASK ME ANOTHER Challenge? VELOUR: Absolutely. Let's do it. EISENBERG: Sasha, you're going to play one of our favorite guessing games, This, That or The Other. Please welcome back your opponent for this game, Awkwafina. EISENBERG: All right, Awkwafina, Sasha - one thing rappers and drag performers have in common is awesome stage names. So in this rapid-fire game, I'm going to say a name. You're just going to tell me, is it a rap name, a drag name or the name of an off-brand soda? EISENBERG: We're going to go back and forth, so no need to ring in. Let's start with you, Awkwafina. EISENBERG: Lagoona Bloo. Bloo is spelled B-L-O-O. Rap name, drag name or soda? AWKWAFINA: It's got to be a soda. EISENBERG: It's like made up of all the other sodas. EISENBERG: That's what it sounds like, right? AWKWAFINA: I can actually taste it right now, actually. EISENBERG: ...Drag name or soda? EISENBERG: Rap name is correct, yes. EISENBERG: Described as the wackiest white boy on the planet. Let's just let that set in for a second. EISENBERG: Yeah, that's a soda. EISENBERG: Sasha, Twista, like twist with an ah. Twista. VELOUR: Twista - sounds like a delicious off-brand soda. Drag - a rap name. VELOUR: Drag - soda name. EISENBERG: Rap name - Twista. OK, here are your last two clues. Awkwafina - Roxy Pops. EISENBERG: ...Roxy Pops is a drag name. AWKWAFINA: And, Sasha - Heee Haw? VELOUR: Oh, my God - please be a drag name. EISENBERG: I know. I wish, too. EISENBERG: That's a soda. That's an off-brand Mountain Dew. EISENBERG: Called a Heee Haw. Also, another one in that same oeuvre is a Kickapoo Joy Juice. VELOUR: Ooh, that's definitely a drag queen, no? EISENBERG: (Laughter) Yeah, that's just - that's just fun. AWKWAFINA: Let me hit that. You know what I mean? EISENBERG: All right, it's a tie. EISENBERG: Which I guess in this game means you both won. So congratulations, Awkwafina. EISENBERG: Sasha Velour is the winner of "RuPaul's Drag Race" season nine and hosts a monthly drag showcase called "Nightgowns." Give it up for Sasha Velour and Awkwafina.